I think we are going to see a BUMPER crop to coincide with broad commodity weakness. Did they do away with the bio-fuels mandate? No. You'd see sub $2 in a flash if they did. Glenn, hope you are getting your info from a different source than I am. Cold temps and too wet of condition with a very late plant date in big corn country have a lot of potential to backfire and yield poorly. still time for that to change and boy I sure hope it does. Don't wish bad luck on anyone. Somebody thinks we are going to have a bumper crop as futures have fallen a great deal in the last 2-3 weeks! that would definitely help prices drop. I worry about the reports I have heard from friends, associates and co workers that plenty of corn got planted late after very wet soil conditions. I am hoping you are right and I am wrong as I have not heard any recent comments from the last three weeks. . .
T.J. I sure hope I'm right too, but at this point it's all just rumors and scuttlebutt. Something is going on though for futures to have fallen so steadily for several weeks. My two cents. May 15th, we had nothing green, and were at the end of our rope. Fast forward 85 days. We are looking at record crops in our country. We can't get all the hay put up. From the conversations I had with folks at JNHE, where they raise corn, it is going to be really good. the only place I know that isn't very good is eastern Minnesota. My parents went to see my sister north of the twin cities two weeks ago, and my dad said western MN, looks really good, and it all goes down hill from there. I don't want to start a war over market theorys and trends, but I don't know how cheap we all want corn to get. I sure didn't like $7 corn, but I don't think we all need $2 corn either. I've always been told "Cheap grain, makes cheap cattle". I know when grain got high, so did cattle. LIKE I SAID, I DONT WANT TO GET IN A DEBATE OVER MRKT THEORYS. But just saying be careful what you wish for. Boyd, good to hear your input and I agree with your last paragraph. I don't think we will ever see $2 corn again. But I would not mind $4 or even $5 corn for a few years! Might be even better to see some semblance of an average winter around here. Lets just hope ole man winter doesn't show up too soon in corn country. I just got back from a trip to Eastern OK and there is no poor corn between SD and OK. There is some that is short day corn but even that looks good. Frost date will have an impact but the crop is going to be HUGE. I also agree with Boyd. Cheap corn will result in a rampup of hog and poultry production and it will drive beef down somewhat. The one thing going for cattle is the amount of land needed to produce an oversupply simply isn't there. It also takes time to have an oversized cow herd. With hogs and poultry that increase can be done in months on very few acres. Doug, good to hear the positive report as well. there is never any substitution for eyes you trust to verify. Cheap corn is no doubt as bad as expensive corn, and I too do not want to see drastically lower cattle prices, but there is a large part of the cow/calf and feeder sector that needs to see lower prices. IF beef prices were to stay this high (borderline out of reach of most consumers, i.e. slightly overpriced) hog and poultry production will expand anyway. As much as I don't like it, there does need to be a bit of correction in beef prices to ensure high demand. MY hope is that it would be modest enough to cover a large percentage of everyone for a short while to allow some healing(profit). Time will tell. Thanks for the report. I know this is an old post but with the open air comment I figured I would post this pic. I had to pour some concrete slabs at the local growmark fertilizer dealer last week and snapped the pic while I was there. This is a local Perdue grain elevator that brings it by train to delaware from south jersey. 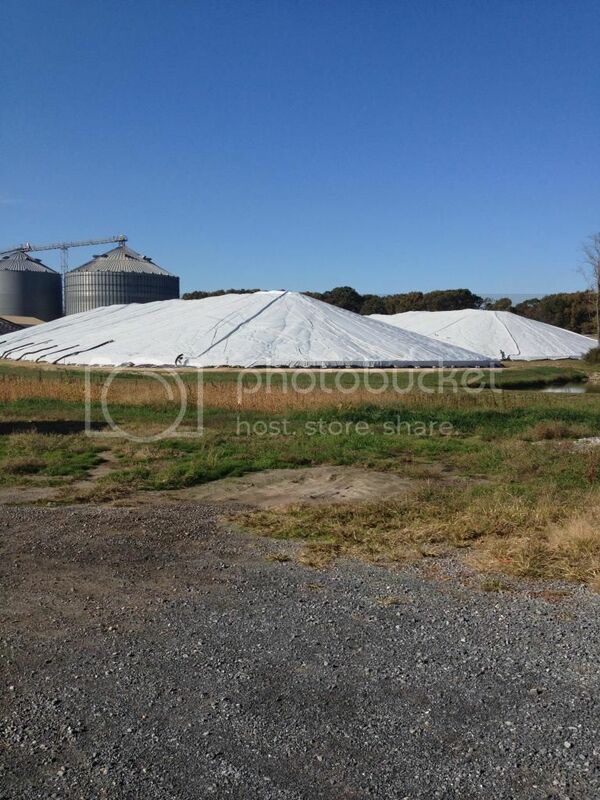 They have a million bushels between the two piles. There is a lime base on the ground under the piles. Corn is 3.75 bushel now.